I Cannot Be Partisan, I am Liberal! Nation of followers, I am more confused than when I was told that people have ideas that differ from my own. What? You mean not everyone thinks that Hitler had a decent shot of being an artist if the CIA had not pressured him to become a dictator? Look it up. It’s a fact I imagined. It’s probably already on Wikipedia. Now something far worse plagues me and makes me question my existence as an extreme republican. And that is the existence of extreme democrats. I thought I was special and extreme! Specially extremely special! Occupy Democrats are forcing me to question myself. What is the point of being extreme if my opponents are going to copy me? As it confuses me, it also enrages me. How dare they take my system of pure outrage and use it against me! Against us, my fellow demo-…republicans! Yelling things without proof is the system that we perfected. And Jeff the intern had sent in papers to copyright this technique. Wait, he didn’t? Are you sure? Dammit Jeff! You are going to get such a spanking when I am done here! I have to say, if it weren’t for the mention of Obama, I would not be sure of whether I was supposed to be in support of the image or the comment. Thank goodness people use names and labels! But if you look at what Occupy Democrats has done, it is clearly a direct hijacking of our republican bashing system. Just look at Bill O’Reilly and his attempt to portray Christianity as a philosophy and not a religion. It is this kind of insane, unintelligent, and completely one-sided arguments that we have spent years developing. Then we honed our skills, and trained the younglings; Bill O’Reilly, Megyn Kelly, pretty much all of Fox News, and many of the famous of the republican party. Some of them tried to form their own dojos, like Rand Paul. He was a failure. But when I heard about Governor Cuomo’s idea to shut down the government to force gun reform, I lost it. That was our idea first to force discussion about Planned Parenthood! And as I researched further, I found MSNBC and other liberal news sites pulling our republican tactics on us. What has the world come to when populace-view grabbing television techniques can be taken and used so easily! It’s like no one respects their senseis and the hard work we went through creating these martial arts for them…damn you, Ralph Macchio! It took some time, but after shooting my gun into the sky and pointing it at random passersby, I calmed down enough to realize the beauty of this moment. Like Saint Paul on the road to Damascus, I felt the sun start to give me sun burn and ran indoors as fast as I could. Occupy Democrats may have taken our system, but they can be just as destructive to bipartisanship and open dialogue as we are. In fact, no one can deter talks between two groups better than us extremists. 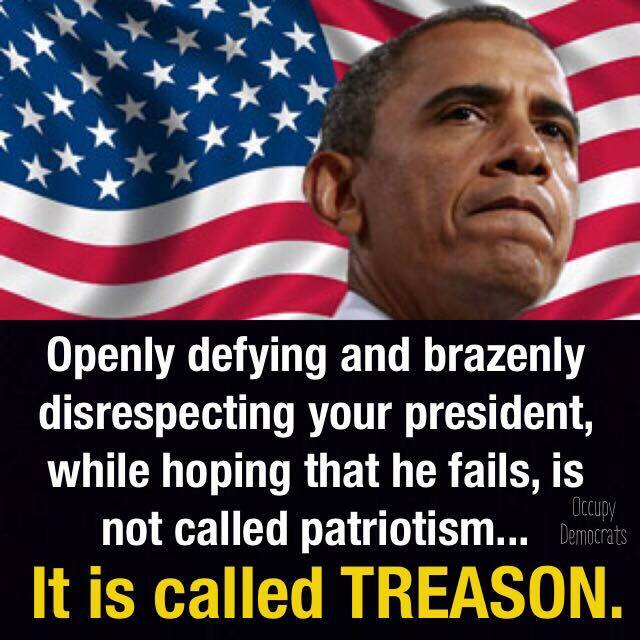 So keep posting your images that claim anyone who dislikes Obama is a traitor to this nation while claiming that we should lower the amount of people we have in our prisons. We will keep screaming about the war on our religious holidays, that are really only part of our philosophy. And maybe for a class project, we can trade extremes, try and fight from the opposite perspective. Because it doesn’t matter what we are saying, so long as it has no basis in fact and blatantly attacks the other side! I want to see more of this, Occupy Democrats. So long as you have us focus on fighting you and your extreme ideas with our own extreme ideas, we will never have to talk to each other about real issues or worry about making real change. 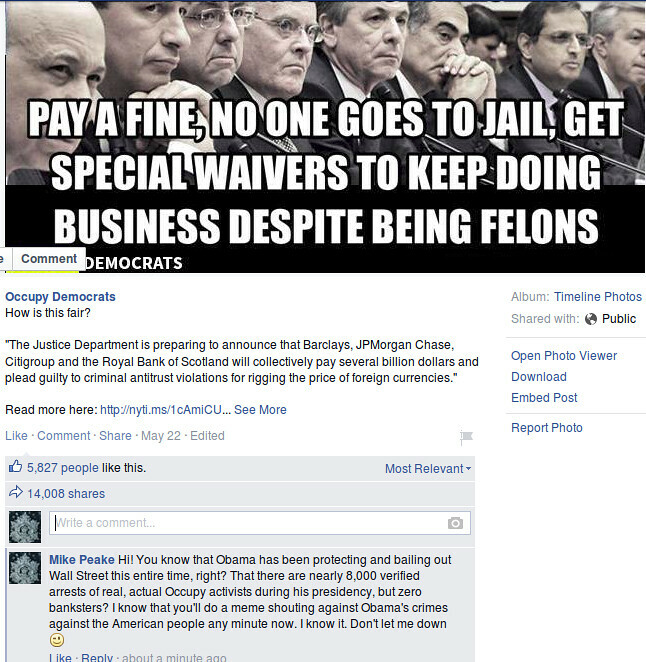 Want to read from other people about Occupy Democrats? Click on the links below. This one is rather well worded. This one is a little more angry, but he gets his point to the reader.